The Sanyo MIR 253 Refrigerated Incubator delivers a easy to use, upright lab incubator with tight temperature control across a broad range. This cooling incubator has a digital interface with touch pad controls and can store up to 3 frequently used programs, each holding up to 99 steps. The temperature range of the MIR 253 covers -10 to +50°C, providing a controlled environment for low temp applications, and BOD analysis. 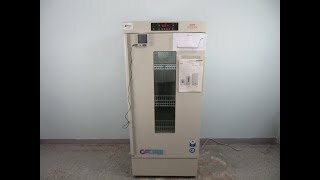 This cooled incubator also has features such as program repeat, up to 99 times, high and low temperature limits, and a timer function up to 99.5 hours. The interior of the Sanyo MIR 235 is 9 cu-ft, lined with easy to clean stainless and adjustable shelving, and is brightly lit so you can check on samples through the glass viewing pane without disturbing conditions within. This Sanyo MIR-253 Heated and Refrigerated Incubator has been fully inspected and was tested at -10°C and then at 50°C, system passed with a clean bill of health. All of our lab equipment comes backed with our standard warranty. Should you have any questions about, please don't hesitate to contact us we have a broad range of incubators and would be happy to help you find your fit.